The Ministry of Health is set to draft a law on gender transformation, scheduled for submission to the National Assembly before 2020. 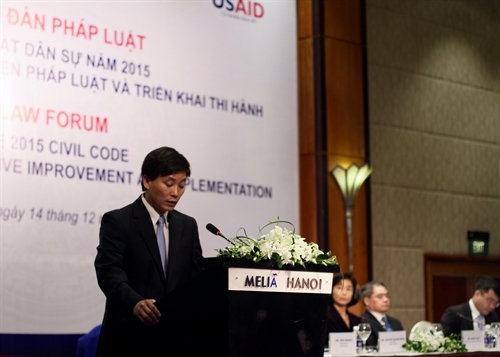 Such was remarked in a law forum hosted by the Ministry of Justice and the United States Agency for International Development on December 14, aiming to introduce key changes of the 2015 Civil Code and solutions for the implementation of the Code in a number of areas of interest of national and international communities. For the first time in the law-making history of Vietnam, the re-determination of gender and related rights of trans-gendered people have been recognized under the Code, making Vietnam one of only around twenty nations in the world to allow gender re-determination, said Justice Ministry representatives. Speaking at the forum, Deputy Minister of Justice Nguyen Khanh Ngoc introduced the Legal Partnership Group, which was established in July 2016 under Justice Ministry Decision No. 1563. The Group is functioned to share information on policies and laws, strengthen international cooperation in legal areas and advocate and coordinate legal funding opportunities in Vietnam. This forum is the continued partnership between the Ministry of Justice and the United Nations Development Program since 2004, Ngoc said, adding that the Ministry would regularly organize forums to further encourage dialogues on judicial and legal reforms and cooperation between Vietnam and international organizations. During the forum, participants also reviewed the breakthroughs provided in the 2015 Civil Code, including ownership rights and personal rights. The Code was passed by the XIIIth National Assembly and will come into effect in 2017.